Friday Wrap-Up – News from Hammond River, Brasseurs du Petit-Sault, Big Tide Brewing, Rockbottom and more! Happy Friday loyal Beer Readers! Grab a pint and take a few minutes to get caught up on all the Beer News that’s fit to print. • Hammond River Brewing has a new beer in the works. Owner/brewer Shane Steeves confirmed that he just brewed a California Common (aka Steam beer) as a tribute to his father, who recently passed away. Brewed in the classic style using a San Francisco Lager yeast, yet fermented at a warmer, closer-to-Ale temperatures, the goal is to have an “easy-drinking beer with bready and toasty notes, along with some fruitiness”. Hopped entirely with Northern Brewer (a “woodsy”-type hop), the beer will be named Gammie, which is what Shane’s father was called by his grandchildren. We’ll keep you updated on the progress of this beer; we’d also like to express our deepest condolences to Shane and his family. • Late last week, Brasseurs du Petit-Sault announced that they have officially begun selling their beer! They posted on their blog that their Witbier, Tante Blanche, is now available on tap at the following locations in Edmundston: Fraser-Edmundston Golf Club, Station 127, Frank’s Bar & Grill, Resto-Bar le Deck, as well as the Hotel Victoria in Saint-Quentin. The beer should follow shortly in bottles; look for it in Edmundston and Grand Falls ANBL stores by July 14th, and hopefully further across the province in the near future. Tante Blanche will also be pouring tomorrow at the Brewer’s Bash in Fredericton! • Speaking of the Brewer’s Bash, it looks like they’re a little short on volunteers, so if you don’t have a ticket, this is your final chance to attend the sold-out festival! Four hours of volunteer work will get you into the festival, AND access to a special volunteer party at a later date; send them an email if you’re interested. • Big Tide Brewing has recently released their very popular summer seasonal, Karnival Kolsch. This hybrid German style is easy drinking, and perfect for the patio weather we’ve been enjoying recently. The beer was brewed using Pilsner, acidulated and Munich malts to 4.5% ABV and hopped exclusively with Saaz to 50 IBUs. Brewster Wendy Papadopoulos tells us, “I brewed it because my brother in law, who has spent a fair bit of time in Cologne, Germany, had been asking forever for me to brew a Kolsch”. This hybrid style, specific to Cologne, uses an ale yeast, but is fermented fairly cold, and is usually lagered for at least a month. This week also saw the end of the Tin Can Porter, and the return of the Hemp Pale Ale at Big Tide. • Propeller Brewery has announced the return of their very popular Prop’r Cask Nights August 15th, after a winter hiatus. Coinciding with the Local Connections Halifax 2014 Sausage Fest, Ludo Eveno of Agricola Street Brasserie will be in charge of the sausage-themed feast to pair with the beer. As always, a special cask will be tapped for the evening, and attendees will be able to sample it, as well as Propeller’s standard lineup. Limited tickets are available online now, and include a commemorative Sausage Fest glass to keep. • Speaking of Propeller, both they and Boxing Rock Brewery celebrated anniversaries on Monday, July 7th. Propeller turned 17, and Boxing Rock celebrated their first year of business. Congratulations to both on these great milestones! 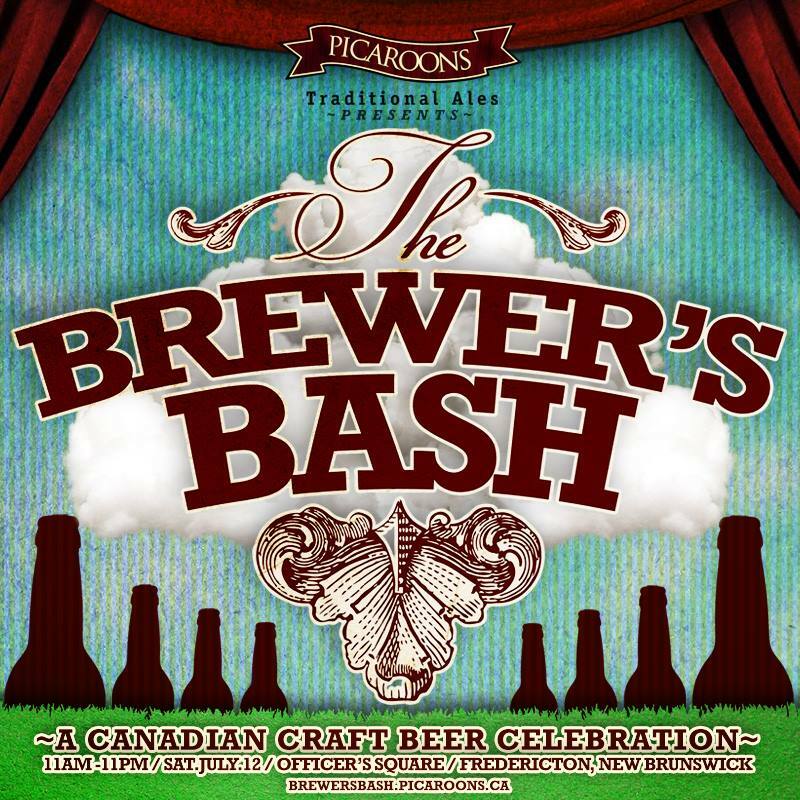 We’re only a few days away from this year’s Brewer’s Bash in Fredericton! Put on by Picaroons, the festival will be held this Saturday, July 12th from 11 am – 11 pm in downtown Fredericton at Officer’s Square. This is the second year for the outdoor event, and it promises to be at least as fantastic as last year! With about 60 breweries from across Canada present (about 1/3 of which are from Atlantic Canada), there will be over 300 beers pouring. With many of these beers typically not available in our region, the Bash offers a great excuse to get outside and enjoy a lot of new craft beer! For entertainment, the outdoor festival will have a DJ spinning music throughout the day, and live tunes in the evening. Both Cyndi Cain and The Chronos Band will be performing; unfortunately, the also-scheduled Zeus has had to cancel due to medical issues. Luckily, Cyndi Cain and Chronos have agreed to extend their sets, so there’ll still be plenty of live music for your listening pleasure! Ticket-holders can come and go as they please, but there will still be food options available at the festival. Milda’s will be serving up some wood-fired pizzas, and reLiSH will have several burgers available for purchase, including The Brewster, with lager onion chutney, cheddar cheese, and hickory sticks. – Picaroons – You’ll have to wait until the festival to find out, but it sounds like they have some new and interesting brews planned! – Red Rover – Spring Brew, Summer Brew; also, look for a collaboration with Picaroons! Unfortunately, Railcar Brewing will not be attending, as previously reported. Due to problems brought on by Hurricane Arthur, their recent batch of beer will not be ready in time. We look forward to trying their beer in the very near future! Also unfortunately, Shiretown has been forced to pull out of the festival. Hopefully we see them at the next festival! – Garrison – Nut Brown, Nit Wit, Raspberry Wheat Ale, IPA, Tall Ship Amber; they will also be pouring Glutenberg American Pale Ale, Red and Blonde. Looks like plenty of great options, with lots of seasonals and one-offs joining regular-line-up beers! Like last year, the event sold out quickly (despite 500 more tickets being sold this year)… however, they announced this morning that they are holding another ticket giveaway contest later today. Keep an eye on their Facebook page for your chance to win! We hope to see you at the festival on Saturday! Friday Wrap-up – News and New Beers from Garrison, PEI Brewing, Propeller, Bad Apple, A.W.O.L. Brewery and more! Happy end of the week! How about some local beer news to transition from stifling hot temperatures into hurricane weather? • Garrison Brewing Co is releasing a special beer today, Summer Fest Blonde. Brewed as a celebration of the 15 year support of the Halifax Jazz Festival, this light ale was brewed with Maritime Malt and 10% wheat malt, and hopped with Columbus. Weighing in at 4% ABV and 8 IBUs, this will be a nice refreshing drink to enjoy at the Fest. It is being launched today on tap at the JazzFest (which runs July 4-12), and will be available soon on tap at the brewery for samples and growler fills. For a peek into Garrison’s brewery expansion, and the Summer Fest brewday, check out this post by Jazz Marketing assistant Tenille Goodspeed. • PEI Brewing Co. has brewed up another new beer – Vic Park Pale Ale is described by the brewery as an “amped up Pale Ale that isn’t quite an IPA”. Brewed with a grist of 100% Vienna malt (which provides a flavor of lightly-toasted bread crust), the beer is hopped with Citra and Kohatu, which provide aromas and flavors of grapefruit and tropical lime, as well as a “spicy noble character”. Finishing dry, the beer comes in at 5.2% ABV, with ~40 IBUs. Only a small batch was brewed, so it’s only available on tap at the Gahan House, and for pours/growler fills at the brewery. • Propeller Brewing Co is continuing their very popular One Hit Wonder series, with this week’s release of their Session IPA. Brewed with 2-Row Pale Ale, Crystal, Wheat and Pilsner malts to 4.5% ABV, this beer is punching above its weight in the hop department, with lots of Cascade and Columbus , to 45 IBU bitterness, and lots of aroma from late hopping. As with all of the One Hit Wonder beers, the best place to guarantee satisfaction is to grab a growler at the Halifax and Dartmouth brewery locations. And if you drop by the Dartmouth brewery today, you can grab lunch from the Cheese Gypsy food truck onsite from 11:30-3pm. • Bad Apple Brewhouse is launching a couple of new beers as part of their Tap Takeover at Stillwell tomorrow (a few tickets to the noon and 8pm sessions are still available, contact Stillwell to grab some). While some of the new beers were brewed in small batches only for this special event, there are a couple that will be available at the brewery beginning next week. Their East Coast Beer (Sea Salt and Caramel), weighs in at 6% ABV, and features products from three important East Coast industries: Farming, as the beer was brewed using Maritime Malt; Fishing, as dulse was added to the beer for a light salt character; Forestry, as the beer was aged on locally-grown cedar. The HopScotch Barrel-aged Double IPA will also be available next week at the brewery. This 10% ABV and 100+ IBU beer has been aging in a freshly-emptied Glenora barrel since February. Fear not, hop heads, as upon transfer into the barrel, the beer was hammered with Simcoe, Citra, and Galaxy varieties, and the aroma has definitely persisted throughout its hibernation. Both of these beers are available in Squealers at the brewery. • There’s another new brewery looking to start up in New Brunswick – A.W.O.L. Brewery will be located in Riverview, and is founded by homebrewer (and Sergeant in the Canadian Army) Robert Black. Currently, Robert plans on having three beers – including a Belgian Pale Ale, an Amber brewed with rye-soaked oak chips, and a hoppy American Brown – and one mead in his regular line-up. A.W.O.L. currently has a fundraising campaign set up here, to help raise the money necessary to build their 2-bbl brewery, and to be operation by this fall. There’s several incentives available, based on donation amount, ranging from pint glasses to the chance to be an assistant brewer for a day. Now’s your chance to help a local brewery get started! We’ll have more news on A.W.O.L. as their progress continues. You can also follow along with them on Twitter and Facebook. • The Picaroons Brewer’s Bash is only a week away, and their beer truck is currently making its way east to Fredericton! Its trip began earlier this week when it started picking up beer from participating breweries in British Columbia, was in Saskatchewan yesterday, and heading through Manitoba today. You can keep an eye on their Twitter account for updates. And stay tuned next week, as we hope to have a list of the beers being poured at the festival by the Atlantic Canadian breweries attending, similar to what we did last year. • Looking to get a job at a newly-opened craft brewery? Well, Tatamagouche Brewing (which just opened a couple of weeks ago) is looking to fill a part-time position, with the possibility of stepping up to full-time. The job involves lots of beer-lifting, and experience in customer service is required. Drop by the brewery if you’re interested, or send them off an email. • A reminder that tickets are still available for the North Brewing Beer Pairing Reception at harbourstone sea grill & pour house July 10th. The full menu is available on their Facebook page, and will mark the launch of their new California Common beer. Tickets are only available online, so pick them up now! On a personal note, Chris would like to thank Alan and Brenda at Meander River, the Sea Level and Port Pub crew, and Jeff at Bad Apple Brewhouse for a wonderful Canada Day in the Annapolis Valley. Showing six beer-thirsty American visitors around our region was the perfect way to spend July 1st!